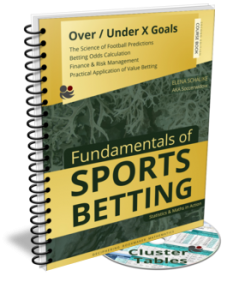 Fundamentals of Sports Betting (Betting on Over/Under ‘X’ Goals) is unlike any other book you will find elsewhere. It contains insights into how mathematics and statistics are applied to bookmaking, information that is rarely (if at all) found in the public domain. Have you ever wondered how bookmakers set their odds? They must be pretty good at it to remain trading in a high risk industry built on small margins! Remember folks it’s all about finding the “edge”. It is common knowledge that the gambling industry as a whole relies to a large extent on the ignorance of its customers and, only by understanding how bookmakers think and act, will you ever be able to compete with them on a level playing field. The Most Valuable Book About Betting You Will Ever Buy! This course is designed to give you the essential, fundamental knowledge necessary to understand odds calculation and the bookmaker market. It deals with relatively simple descriptive statistics and teaches you how to look at data sets, calculate your own probabilities and odds, analyse the market odds on offer, and make informed decisions when predicting football results. Amongst the topics you will work through are distributions, deviations, graphs and charts, odds calculation, financial terminologies, risk management, and of course, how to identify ‘value’ in the betting market. You will gain a deep understanding of the many different elements required to understand the bookmaker market and odds calculation. Many false beliefs that the majority of gamblers and fans of football have about betting will be exposed and stripped away. Readers will also be enlightened to learn about how odds are set in the market, where to find ‘errors’ in market prices, how to evaluate data and graphs, and much, much more. What Do You Get For The Money? The course comes in electronic format and the bundle includes the course book (PDF*) and a Bundesliga cluster table (Excel) for studying. This course employs a didactic method of teaching, which is an educational technique. It is a very structured style of learning and as such, each section of the course should be mastered before moving on to the next. To further encourage you to learn, there is a plethora of exercises to practice what you have learned, and the solutions to the exercises are found at the end of the book, sometimes embellished with further explanations. All of the course lessons are presented in a pragmatic, easy-to-follow, step-by-step fashion, with no more than passing respect towards the sport of football and the passion of its fans. After all, this book has been written by a lady who loves maths but dislikes football…! In addition, you will receive the very latest Bundesliga table for the current season, so that you can put into practice what you have learned and within the course, you will find a discount code enabling you to download for free the German Bundesliga sheet in future seasons, meaning that you will always have access to the most current Bundesliga cluster table, forever: it doesn’t matter when you bought the course. *By the way, the PDF is a professionally formatted document and if you have a double-sided printer you can print your own book for studying. For traditionalists, the PDF has been professionally formatted for double-sided printing. If you like, you can print your book in full-colour with a cover and add slick spiral binding. Those who prefer to read the document on their computers will find the chosen font (Myriad Pro) easy to read on the screen. Myriad Pro has a clean sans-serif aesthetic which makes it highly accessible. The electronic version also contains a plethora of easy-to-navigate links to help the learner find his way around the document. …or ask any questions in the comment section below. I am very interested in your book ‘Fundamental of Sports Betting – Over / Under X Goals’. I found that the updated edition is Jul-16. Just wondering if there is any new edition on the way? If so, I’d rather wait for the updated edition than buying the current one. Also, will I receive any lifetime update whenever you refresh the ebook? Lastly, any plan to release your ebook about 1×2 market? the maths and statistics in the book are absolutely time-less; it’s the examples that may seem a little bit outdated as it’s a 2016 edition. Otherwise, there isn’t anything outdated in the book. Of course, in the future there will be an updated edition but certainly not before 2021; one update every five years is more than enough for a reference and course book. Regarding giving lifetime updates… we offer them for the Bundesliga Cluster Table that accompanies the book but not for the course book itself. Sorry. As feedback for your course I wanted to say that it was very exhausting to master it even if you have completed a technical course of study, but I have fought my way into it. The course is really very well written and clarifies many myths about betting and is a very good reference book. Regarding an ebook about the 1×2 market… There won’t be a 1×2 ebook very soon. Things like books take ages to write. I’m sorry. Maybe next year but maybe even later. Hi i bought the course but how do i get the discount code for the lifetime bundelisga cluster table. the code comes together with the product delivery but you’ll also find it in the course book, page 108 in the practice box. Nearly at the end of the course! Just stuck on question (D) of exercises 7.4 (page 130) where we put the value calculator into action. I’m getting different results in my value calculator compared to the answers on page 151. I notice from the comments section that another of your students had similar issues but I wasn’t sure which was right. What worries me is that I also got different results for Hannover vs Dortmund when I used the Value Calculator then (page 72). Since I want to try to use the value calculator as my main tool to detect value bets, I’m a bit worried I’m doing something fundamentally wrong. I don’t seem to get too much wrong when I do other parts of the course, by contrast. But I’m yet to get the same answers as the back of the book with the value calculator, despite diligently watching your excellent YouTube tutorials. I can email you the spreadsheets or screenshots of them. Likewise, if you have other past examples of using the value calculator for specific matches, I could have a try at them and we could compare notes. Or if you plan on using the value calculator for any matches this weekend, I could have a try at those specific matches too. I’d be most grateful for ANY assistance. Sorry for being a nuisance… again. this exercise in the course has unfortunately a bug. When putting together the examples I have for some reason missed one season what means that the 25 games that form the basis for the example calculations are incorrect. Therefore, you have probably done everything right. I’m very sorry! Just carry out the calculations with the figures shown on the screenshots in the course (the numbers for the last 25 respective games). Then, when you fully understand the calculations you can repeat the exercises with the correct data and from your provided example, you can already see that the ‘correct’ results only differ very slightly. That is why I haven’t worried about updating the course and rectifying that error. The course is about understanding odds calculation, even if the example is ‘made up’ like it unfortunately happened in this one exercise. The good news is that there aren’t any more errors in the course, at least none of which I’m aware. Just wondering for Chapter 7.2- Value Betting using Cluster Group Tables, I’m having a bit of trouble understanding the Cluster Groups. I’ve opened the accompanying spreadsheet and gone to the Betting Tables tab. Taking Hannover at home, as an example. So, on page 120, there’s a copy of (part of) the table from the spreadsheet. But what I don’t get is how we have separated Hannover’s 85 home games into four quartiles? And what’s the significance of each quartile? So for example, with the first quartile. I’m at a loss to understand why the HO/AO range is from 0.000 to 0.604. Or why that first quartile is reflected by odds from 1.01 to 2.20. I can sort of understand how, as Hannover is perceived as one of the weaker sides, it gets put in the bottom row (and it’s HO/AO quotient, against Dortmund, as 5.065 fits into that bottow row, between 1.1031 and 100.000). But I don’t understand why it’s those number specifically. team x and team y. Overall, I just can’t get my head around how the quartiles are arranged from 85 matches one team has played in, precisely what they signify and exactly what the quotient ranges and odds ranges refer to. Sorry for such a long post from me which may have seemed a bit jumbled. The division of HO (Home Odds) by AO (AO Odds) reflects the “strength” of the teams perceived by the public. For example, if there is a match with “equally strong” teams, the HO/AO quotient is roughly between 0.8 and 1.2. When building the quotient we’re not asking ourselves the question, “Are these teams really equal?” We do not calculate the 1×2 odds either, but simply use market prices and assume that the Bookmakers have reflected public opinion as well as possible. Team ranking and public opinion is taken permanently into account in the 1×2 odds. That’s how bookmakers ensure that they stay in business and make their money! Take any Bundesliga weekend and cluster the matches according to the above HO/AO quotients (before kick off) and check against the distribution of results. You will see that they won’t distribute according to the implied probabilities of the AO/AO clusters. There is a correlation between the HO/AO quotient and the O/U odds! I am currently expanding upon this whilst writing an update for the German version of the O/U course. Unfortunately, the explanation is not short and/or sweet enough to pack it into a comment. You’ll just have to believe me that the HO/AO quotient is a very important factor when judging if OU odds contain value or not. OK. So, I calculate the HO/AO by dividing the 1 x 2 odds. Then I look at the cluster tables. I look at the the appropriate row (or quartile) of the table for, say, Hannover, to find out which odds correspond. And then I make sure it’s lower than the market odds and then do the same with Dortmund. That’s it? But what I don’t understand is how to calculate the four quartiles of the HO/AO for each team, myself. What’s the process for separating the 85 previous matches into four quartiles? How does one build the cluster tables, oneself? Cluster tables are crucial to a successful betting portfolio using the 5 seasons method, right? Let’s suppose I want to do this for Serie A. I’ll need to make a set of cluster tables, won’t I? Sorry Audiendi, this is a Betting course and not an Excel course. I’m not even going to try to explain advanced Excel formulas and how they work, and of course there are plenty of other websites dedicated to teaching Excel. All good, all good. Sorry I’m sorry for being incredibly annoying. I’m such a stickler for trying to grasp all the finer details. I thought I had made a mistake by not knowing how to construct the cluster tables myself. So, the course doesn’t explicitly teach how to construct the cluster tables (in the way it teaches SD, RSD, %CV, expected losing streaks, etc.)? I’d just buy the cluster tables, sooner than trying to replicate them. Much easier. So, basically to put the five seasons method into practice, it’s necessary either to buy the relevant cluster sheets (or to replicate them)? this course is designed to introduce readers to the essential, fundamental knowledge necessary to understand odds calculation and the bookmaker market. The intention of the course is to introduce the subject of odds calculation to punters. It is therefore not a “five season method”; it teaches distributions, graphs, financial terminology, etc… all with the goal to show the reader how professionals (such as bookmakers) approach setting their odds. Please look at the image above… to put the course into perspective… The course is an ‘introduction’ and if there would be ‘betting degrees’ at universities then students would learn the contents in the Bachelor Year 1. Therefore, please work fully through the course first, until you understand absolutely everything. Then try your knowledge on the Bundesliga. If you feel that you would like to learn more, then consider purchasing the EPL as it is a much more liquid league on the exchanges. To summarise, you must thoroughly understand the fundamentals before mastering odds calculation, and I’m afraid that like everything worth having in life it will take time to accomplish. Me again, sorry. I wondering if there’s a mistake in the book or if I’ve miscalculated somewhere. It’s only a small difference, but I wanted to be sure I’m on the right track. On page 89, for (G) (i) we have to calculate the probability of winning a bet for ‘Over 2.5 Goals’ using the Five Seasons Method compared to the Value Calculator Method. You’ve provided Zero Odds for both. Zero Odds for the Five Seasons Methods are 1.60. While Zero Odds for the Value Calculator method are 1.43. Have I made a mistake somewhere? Not the other way round! Value Calculator method expected ‘Zero’ probability: 69.89%. Thanks for that. I understand where I went wrong. All that was written, in the question, I’d forgotten that we’d already carried those calculations earlier. And it makes sense how a statistical probability is a more precise representation than the betting odds. As such, I understand what you mean by the idea of calculating the probability first and, then, converting it into odds. I have recently purchased the over/under betting course which I have to say was excellent. It has certainly opened my eyes to areas I had simply never considered before. After studying the course (I am still studying it and will be for a while yet) I purchased the value & true odds calculator, used it on a few games at the weekend and again have to say I am very impressed with the product. I bought the course this weekend and have been working through it. I now have a headache but feel enlightened. Just bought your guide, and learned a lot. Many, many thanks! I can recommend it. Thank you very much! I shall spend as long as it takes to learn the valuable information you have sent me and I shall not risk a penny of my bank until I understand it all. Thank you for placing me one step closer to profitable betting. It took me a year to save up my bank to get to this stage and now armed with the knowledge you've given me hope to realise my dream. I've just purchased the Over/Under course and Value Bet detector. They are both excellent products and bring together all the knowledge that I have accumulated over a few decades. Unfortunately, it has taken me this long to figure out the simple fact that value bets + staking plan = steady profits. But when I had nothing to do one day I re-opened it, gradually overcame my fear, and began making some satisfying progress. The exercises and questions really are a great idea and help to commit the concepts to memory, and having the answers provided at the back of the book is hugely reassuring, especially when you get them right. Hi Soccerwidow, I stumbled across your blog recently and I've been totally enthralled since. My advice to everybody would be to purchase Soccerwidow's "How to calculate Odds" study book. It's extremely comprehensive and anything I didn't understand I googled, and googled again, and still google. It will probably be a few months before I understand it fully but as I bet on both soccer & Australian Rules football, and I found it invaluable. I can't wait for your next article. Thanks.